Learn about Project Reclaim here. As, seemingly, most of the rest of the world, I’ve got a (50GB subscription to) Dropbox. I use it in place of the ‘Documents’ folder on my MacBook Pro and, at work, instead of the ‘My Documents’ folder in Windows. Everything is kept in sync between the machines and it’s all backed-up in the cloud. That’s all well-and-good, and three places to store data is obviously a good situation to be in. However, given the recent Amazon EC2 outage (Dropbox uses EC2) I’d like to have a local backup solution. Until 2009 my wife and I used to do this with the use of an Apple Time Capsule, but the incremental backups used to slowdown our laptops so much that we eventually sold it. Every now and again I’ll backup to a 2TB external hard disk, but that’s only when I remember. 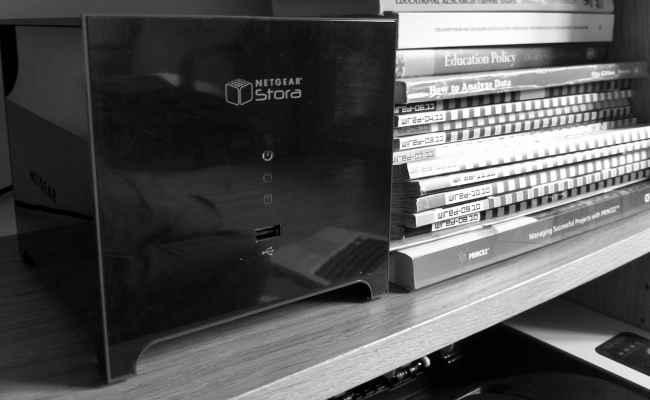 After looking at our needs and the options, I settled on a Netgear Stora* and two 2TB hard disks in RAID1 configuration**. This means that data is written to both disks simultaneously – i.e. a Redundant Array of Independent Disks. It came in at about £170 all-told, which isn’t bad at all – especially when you consider that it’s got secure web access to the files it contains and is extremely easy-to-use. Once you’ve spent 10 minutes getting the Stora up-and-running, you need a way to get files onto it. That’s as easy as drag-and-drop if you want it to be, but I want a more robust solution. As with Dropbox, after the initial backup I only want to transfer the files that have changed. Enter rsync – or, more accurately, arRsync (Mac only). The graphical front-end is simple and effective. I refused to pay $40 for the privilege of the (admittedly widely-acclaimed) ChronoSync. *Other NAS drives I looked at have bittorrent functionality. This can be enabled on the Stora by looking here or here. **This isn’t a techie post, so if you want to read about RAID, I suggest this post on Wikipedia.